In a previous post, I talked about a key advantage of nasal breathing, which is getting your heart rate down, because doing so uses less oxygen and makes you more efficient. But there are many other key ways nasal breathing can help. 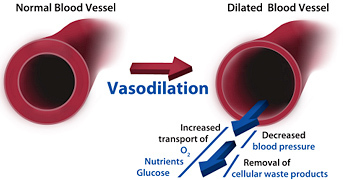 One big benefit is vasodilation. This fancy word refers to the widening of blood vessels that occurs when muscle cells within the vessel walls relax. (Essentially, the reverse of vasoconstriction.) The result is an increase of blood flow that delivers more oxygen, glucose and other nutrients to muscles and their cells. When you mouth breathe or even worse, gasp for air as you run, you trigger the fight-or-flight (sympathetic nervous system) response of the body. It’s like putting your body on lock-down, with your body shunting oxygen away from any part where it’s not absolutely essential. Oxygen, glucose and nutrients don’t move as freely again until after the danger’s past. With limited oxygen, your muscles won’t work at full capacity, except for those short bursts of speed which don’t require oxygen. Your brain, accounting for 20% of your entire body’s oxygen consumption, doesn’t perform at it’s best either. The answer to this is obviously to relax the body and take it out of a fight-or-flight response. This allows vasodilation to take place, allowing more oxygen to the muscles and more oxygen to the brain. This happens naturally when you breathe through your nose. 1. Nasal Breathing Builds up Your CO2 Levels. When you breath through the nose, you don’t blow off carbon dioxide (CO2) as fast. Now in the past, we all thought carbon dioxide was a downright bad thing and we wanted to blow off as much of this “by-product” or “poison” as we possibly could. Whoops, bad idea. It turns out that natural carbon dioxide in your blood stream helps regulate vasodilation and your body’s ability to absorb oxygen. The higher the CO2 levels, the more oxygen you can take in. 2. Nasal Breathing Helps You Take in More NO2. Now this is no laughing matter. nitrous oxide (NO2), or laughing gas as it’s called in the dentist’s office doesn’t just make you giddy, but it also radically opens up your vessels, allowing more oxygen to flow. While there’s nitrous oxide all around us, we can’t take any of it in through the mouth. We can only take it in through the nose. When we nose breath, we take in up to 8% nitrous oxide with each breath, dramatically opening up our vessels delivering more oxygen to the muscles and to the brain. This means we move more efficiently, feel better, and yes, could even get giggly over time! Want to get in the zone fast? Boost those nitrous oxide levels! These are just a couple of the many ways that breathing through your nose can help you run and perform at your best. They help you bring in more precious oxygen and get it into the cells, and that’s where you need it. So work on that nasal breathing, take it slowly, and realize a little discomfort in the beginning is quite alright. Also, start practicing during your easy workouts, NOT your hard ones. You’re building a foundation here, which will give you greater efficiency, a lower heart rate, and greater strength and endurance, over time.